An MFR information patch/PCR memo pad is available. This is a simple tool to help with on-scene information exchange and to assist with completion of the Patient Care Report following the call. 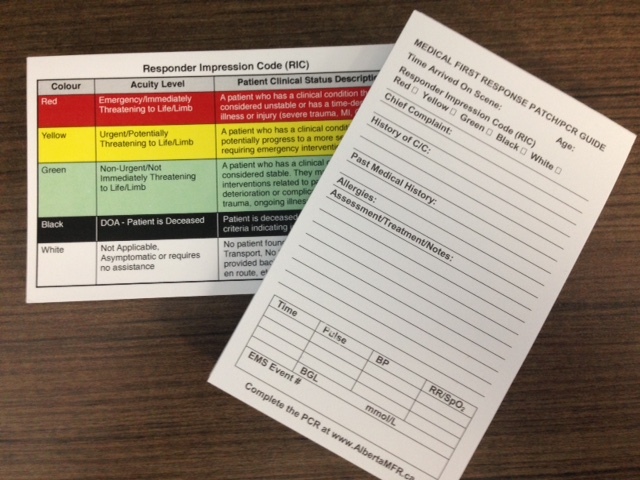 The memo pad (size 3"x5") uses the AHS-supported CHAT format for verbal information reports and also lists the Responder Impression Code (RIC) colours on the back cover. The memo pads are available to agencies that are enroled with Alberta MFR. Talk to your MFR Team contact to obtain some for your agency.